Bioinformaticians at IMIM (Hospital del Mar Medical Research Institute) and UPF (Pompeu Fabra University) have used molecular simulation techniques to explain a specific step in the maturation of the HIV virions, i.e., how newly formed inert virus particles become infectious, which is essential in understanding how the virus replicates. These results, which have been published in the latest edition of PNAS, could be crucial to the design of future antiretrovirals. 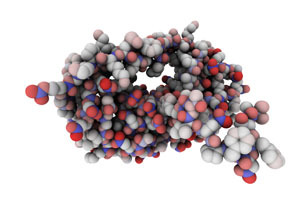 Using ACEMD a software for molecular simulations and a technology known as GPUGRID.net, Gianni De Fabritiis’ group has demonstrated that the first “scissors proteins” can cut themselves out from within the middle of these poly-protein chains. They do this by binding one of their connected ends (the N-terminus) to their own active site and then cutting the chemical bond that connects them to the rest of the chain. This is the initial step of the whole HIV maturation process. If the HIV protease can be stopped during the maturation process, it will prevent viral particles, or virions, from reaching maturity and, therefore, from becoming infectious. This work was performed using GPUGRID.net, a voluntary distributed computing platform that harnesses the processing power of thousands of NVIDIA GPU accelerators from household computers made available by the public for research purposes. It’s akin to accessing a virtual supercomputer. One of the benefits of GPU acceleration is that it provides computing power that is around 10 times higher than that generated by computers based on CPUs alone. It reduces research costs accordingly by providing a level computational power that previously was only available on dedicated, multi-million dollar supercomputers. Researchers use this computing power to process large numbers of data and generate highly complex molecular simulations. In this specific case, thousands of computer simulations have been carried out, each for hundreds of nanoseconds (billionths of a second) for a total of almost a millisecond. According to researchers, this discovery in the HIV maturation process provides an alternative approach in the design of future pharmaceutical products based on the use of these new molecular mechanisms. For now, this work provides a greater understanding of a crucial step in the life cycle of HIV, a virus that directly attacks and weakens the human immune system, making it vulnerable to a wide range of infections, and which affects millions of people around the world.